Current, voltage and resistance are three important concepts in electronics. I didn’t have a clue about these things when I started out. But I could still build fun things, by following the circuit diagrams I found. I just didn’t know what was going on. When I started learning about basic electricity in school, many pieces started to fall into place. I started understanding some of the explanations from the circuit diagrams I built. I like to focus on the practical parts of electronics. But learning some theory as you progress is also really useful. So in today’s article you will learn the basics of current, voltage and resistance. When you connect a small light bulb to the positive and the negative side of a battery, you will get a closed circuit where electrons can flow between the terminals and make the lamp shine. Inside the wires of this circuits, you will have electrons flowing. When I started out in electronics, I misunderstood something. I thought that when a battery got connected, the electrons started from the battery and had to travel all the way through the wire, up to the bulb, before it was lit. But this is not the case. A wire already has electrons in it. And when you connect a battery and make a closed circuit, they start to move. It’s like a pipe filled with marbles. When you put a marble in on one side, another comes out on the other side right away. You don’t have to wait. It happens momentarily. The direction of the current is a bit confusing. Does the current flow from the positive to the negative terminal of a circuit? Or the other way around? In some diagrams, you see an arrow from the positive to the negative terminal. In other diagrams, the opposite. First of all, let me say this: It doesn’t really matter! When you need to do calculations, all you need to do is to decide on a direction and make your calculations based on that direction. No matter which direction you chose – the results will be the same. No direction is the “right” direction. Current can flow both ways, depending on if there are positive or negative charge carriers at work. In metals, we have negative charge carriers. Also called electrons. They flow from negative to positive. In a circuit, current is the flow of electrons. Voltage is the electrical potential difference between two points. Resistance is something that resists the flow of electrons. If this sounds Greek to you, don’t worry. Think about it this way: If you have water running in a pipe, the amount of water running is the equivalent of the current in an electrical circuit. Then imagine that the pipe is clogged at some point. And only a little bit of water gets through. The water pressure on one side of the clog will be higher than on the other side. This difference in pressure between the two points is the equivalent to voltage. You always measure voltage as a voltage difference between two points. The clog itself would be the resistance. The relationship between current, voltage and resistance is called Ohm’s Law. Thanks for the explanation. I really wanted to know those basics. Thanks for the very clear explanation! I was confused for a long time about why the convention is for current to flow from positive to negative when we know electrons flow in reverse… Your statement that it doesn’t matter what the convention is really puts my mind at ease! You also make a very good point that in other types of circuits there can be positively charged carriers (e.g. cations). I’d never thought of that! I am in the field of Electronics and Telecommunication Engineering since 15 years past. 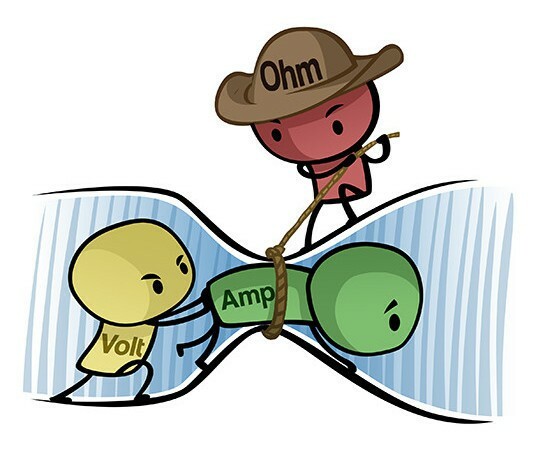 The illustration that you have created happens to be the best which I have ever came across to explain the “Ohm’s Law”. I just updated the illustration to a more modern one, I hope you still like it! Man your amazing God bless you. When you’re working with circuits which do you consider the flow of your electricity, positive to negative or the other way around?? This article had clearly explained the basic perception about electron movement in a wire. It is important point for me as a beginner. Thank you The Author. Hi, I am really loving and benifiting from this effort of yours and have picked as a place to start. Thanks. Also a question? direction of current. You said it doesnt metter what if a simple curcit that lights up an LED, the resistor is placed on left but the current starts to flow from right would’nt it blow the LED? Excuse me if this was a silly question? Current is electrons moving through the circuit. 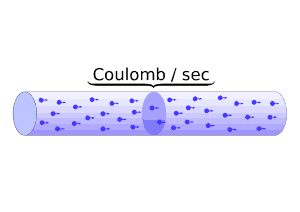 The circuit is full of electrons all the time, but if there is no current, the electrons are not moving. When you apply a voltage, you start to push the electrons around and you get a current. So the current doesn’t start at the battery, then gradually go through the components in the circuit. The current starts flowing everywhere in the circuit at the same time instrantly when you connect the battery. The total resistance of the components in the circuit determine how much current that will start to flow. 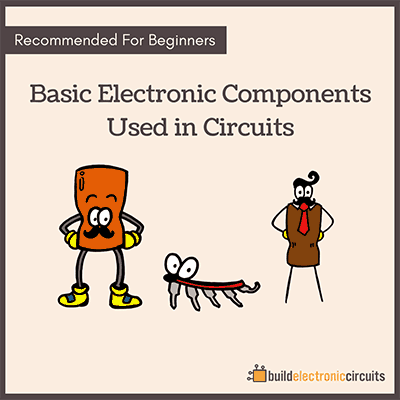 Sir, I am very new to electronics and I have not come across so simple explanation ever before which can be understood very easily and go upto sub conscious level. However, from where should I start learning electronics just to be able to repair household items and not to become an entrepreneur. Pl provide me the step by step chapter like that of school. 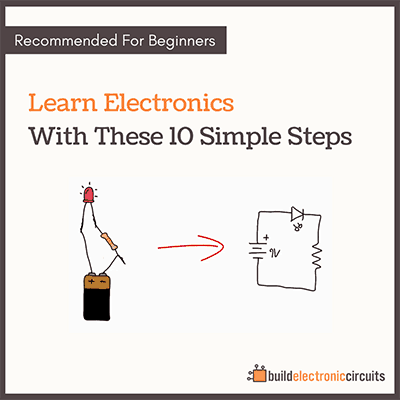 Dear Sir am really so glad for your excellent explanation about Electronics for beginners in fact it’s not for beginners but for all. Am a second year student studding E.T.C, one day when i was in first year i asked a student in final year to tell me what is electronics & telecom and who is an E.T.C E Engineer, surprisingly he said he don’t know, can you imagine that is why i think what you have explained is for all not only for beginners. Since i red it my doubts was cleared, now tell me more about E.T.C and how will i be a successful E.T.C Engineering, please support me with some important website. Then you can find plenty of information either on my website or elsewhere on the web. You can use the search box in the top of the page to find what you are interested in. 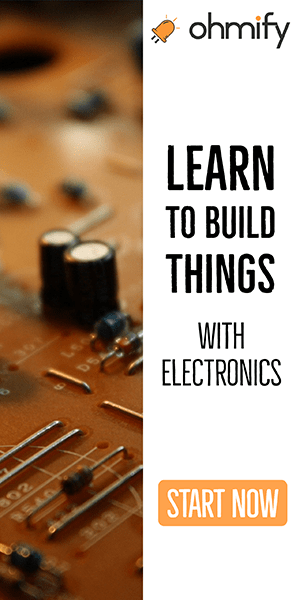 Hello, excuse me if this is a silly question but I am very new to electronics and the subject really fascinates me, I am just now seeking to learn the basics. What do you mean by the entire negative and positive current part and by “the conventional way of talking about current direction is from positive to negative”. Also, is the pressure, which is measured by Voltage pretty much (in simpler terms) how much charge the object has? I mean that electronics flow from the negative terminal to the positive. But even so, we say that current flows from positive to negative. I love your Ohm’s law cartoon, and would like to use it for teaching purposes. I seek permission from the creator/copyright owner to share it with classes I teach. Great to hear Kent! I like the mental image of amps running like crazy when there’s no resistance! Am now clear about the flow of electron especially the way you defined ohms law, God bless you sir. I appreciate your effort to understand what I want about this, Thankyou! sir may you blessed more, please i want to know much about electronics building technology.